Halifax II JD156 ditched in the sea of Kattegat 16/9 1943. 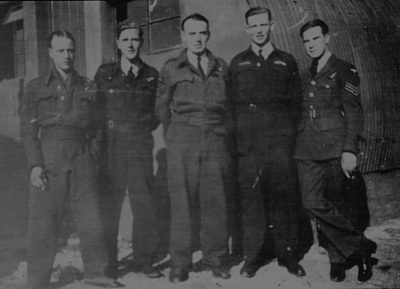 The aircraft belonged to RAF 138 Sqn Bomber Command and was coded NF-W.
T/O 18:26 Temsford. OP: SOE Operation Flat 5 at dropping zone Obraz in Poland. After having crossed the peninsula of Jylland on a outbound track Halifax JD156 at 350 metres altitude was hit by fire from a German JU 88 night fighter piloted by Oberleutnant Hindelmeir of II/NJG3 with the crew of Unteroffizier Gärtner and Obergefreiter Scholz and controlled by the radar station Adler based at Hemstok. The port inner engine of the Halifax caught fire as did the belly fuel tank. Pilot F/S Lloyd A. Trotter RAAF feathered the engine and activated the fire extinguisher and tried to climb to give the crew a chance to bail out. The Halifax would not climb and at 22:22 hours Trotter had to ditch the burning Halifax in the sea off Norsminde on position 56`02`8N 10`21`5E. Trotter, Flt. Engr. Sgt Sam Francis, F/S George T. Jones and Mug F/S Don “Shorty” R. Quinlivan RAAF and one more crewmember all managed to get out and inflated their Mae West. The last mentioned however drifted away from the others. The fire had been observed from Norsminde and a fishing vessel owned and captained by Fisher Sigfred Chr. Petersen and crewed by Peter P. Petersen, Gunnar Gisselmann and Hage S. Alrøe set to sea. Just before reaching the burning wreckage they saw a flashlight flashing SOS and found four flyers in the sea. They were helped onboard and sailed to Norsminde where they were taken to the “Norsminde gamle kro” inn and given a glass of Cognac. George Jone was sat in a chair next to the stove which had rings on the top to put pans on. The lady of the inn moved a pan to allow Jones to burn some papers. The lady now started breaking eggs in a bowl then smearing the egg whites on the airmen burns. A doctor and the Danish police was called for and arrived soon after. Two of the flyers suffered from burn and were treated by the doctor. The German Wehrmacht arrived and the flyers were taken to the local hospital to have their burns treated. After a couple of weeks they were put on a train for Hamburg. Two of the flyers were able to walk while Trotter and a comrade were carried on stretchers. They arrived at Hamburg late in the evening and were taken by their guards to a hut near the station. 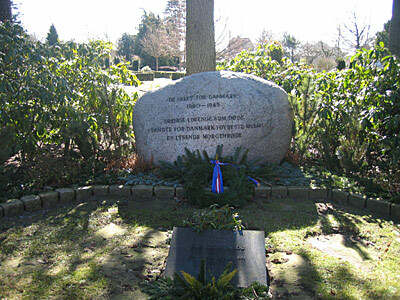 After a while they returned to the station and continued the journey to Frankfurt where they were taken to a hospital just outside the city probably Reserve Lazarett Kuranstalt Hohemark a kilometre west of Dulag Luft at Hohemarkstrasse. After a few days Francis, Jones and Quinlivan were found fit to be moved to Oberursel for interrogation while Trotter stayed until 5/10. After about a week in Oberursel he was moved to Stalag IVB at Mühlberg a.d. Elbe where he stayed until the camp was relieved by the Russian troops on 23/5 1945. Quinlan, Jones and Francis were sent to Stalag Luft VI Heydekrug after interrogation. At a later stage Quinlan was sent to Stalag Luft IV Gross Tychow while Jones and Francis were sent to Stalag 357 Thorn/Fallingbostel. 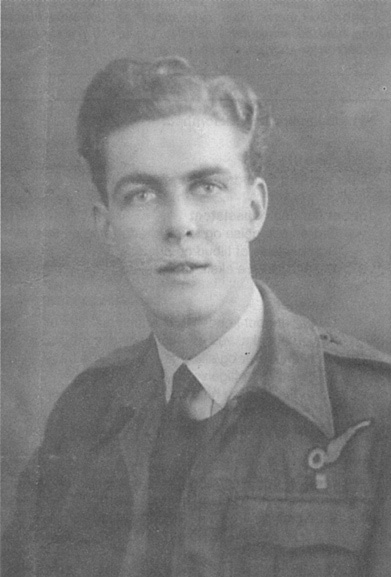 Rear gunner F/Sgt Graham “Snooty” Ernest Snook RAAF has no known grave and is commemorated on the Runnymede Memorial. The body of Navigator F/O James Ried Bradley was found washed ashore at Særbæk on Helgenæs on the morning of Saturday 2/10-1943. He was laid in a coffin and placed in the Særbæk-huset. 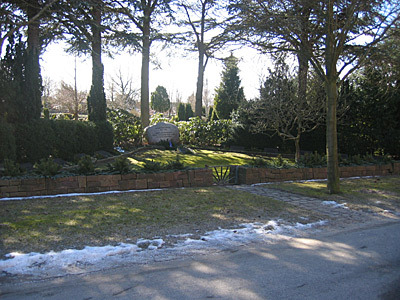 He was laid to rest in Randers cemetery. 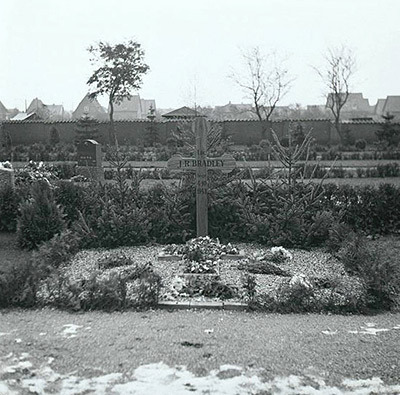 The original grave in Randers. 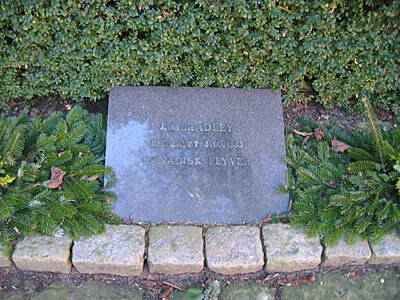 When a Memorial grove was created in Randers Northern cemetery, the coffin of F/O James Ried Bradley was moved there. 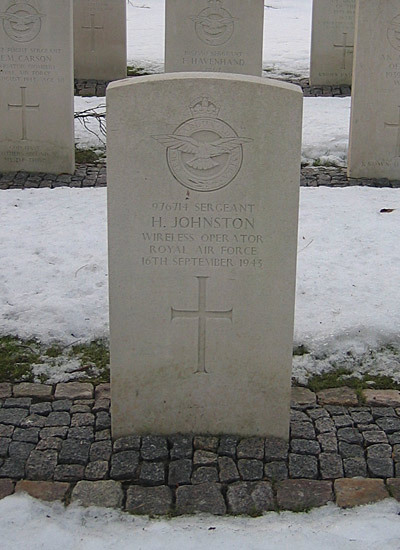 The body of Wop Sgt Henry “Paddy” Johnston was retrieved from the sea off Norsminde on 9/11 and was laid to rest in Frederikshavn cemetery on 13/11 1943. Sources: CWGC, OLCB, LBUK, Report Malling police, Directorate of Lighthouses, “Special duties Mission” by Trotter, Randers Amtsavis.